Let’s face it, the 2017 Kingfish Cup Championship was a scramble. The weather at Ocracoke took center stage for the week, drastically changing the previous conditions and limiting what teams were capable of. In the end, though, it was Mark Henderson and Team Liquid Fire that earned top honors and a massive check. Going through the post-victory interviews with Mark, he was more than helpful in describing Team Liquid Fire’s path to the championship win. He made it clear that much of the success that their team enjoyed was due to the hard work of his wife, Audrey. Yet, due to the tight schedule she keeps, the tournament being pushed back a day kept Audrey from being a part of the celebration at the weigh-in and the awards. With her impact on Team Liquid Fire, that is nothing short of lamentable. During the offseason, I was able to catch up a bit with Audrey to pick her brain about tournament life, and to see exactly what her role within Team Liquid Fire actually was. Audrey gave me the rundown of how her family, previously only experienced with freshwater fishing and some saltwater trips on vacation, progressed from surf fishing into early morning adventures to stake out premier king mackerel spots at the end of Crystal Coast piers. An invitation from a friendly co-worker put Mark and Chris on an offshore boat, and they were immediately hooked on the concept of fishing tournaments. In 2005, a scant three years away from their relocation from inland, Team Liquid Fire was officially born, and the team began fishing tournaments on a 25 foot Contender. At that point, Audrey had little to do with the tournament scene. All that was about to change. It was family friend Ben Beasley that dubbed Audrey the “Little General.” That name has stuck to this day, and it is even fondly used by her husband. At this moment in time, Audrey is in total control of the details for Team Liquid Fire. She handles the myriad of paperwork that comes with both boat ownership and tournament fishing, and for a team that keeps as busy a tournament schedule as anyone in the business, anywhere! When it comes to an out of town event, Audrey handles the travel, the lodging, the parking for the truck and both team trailers, out of state fishing licenses, and all the registration specific to the tournament. Team Liquid Fire keeps an exhausting seminar/boat show schedule in addition to fishing, so Audrey handles that as well. There is no off season. During a period where there might be no tournaments or seminars scheduled, Audrey is making sure that all other details of the team and boat are covered. It might be insurance one day or it may be permits and registration the next. The boys may be resting, but be assured that Audrey is not. 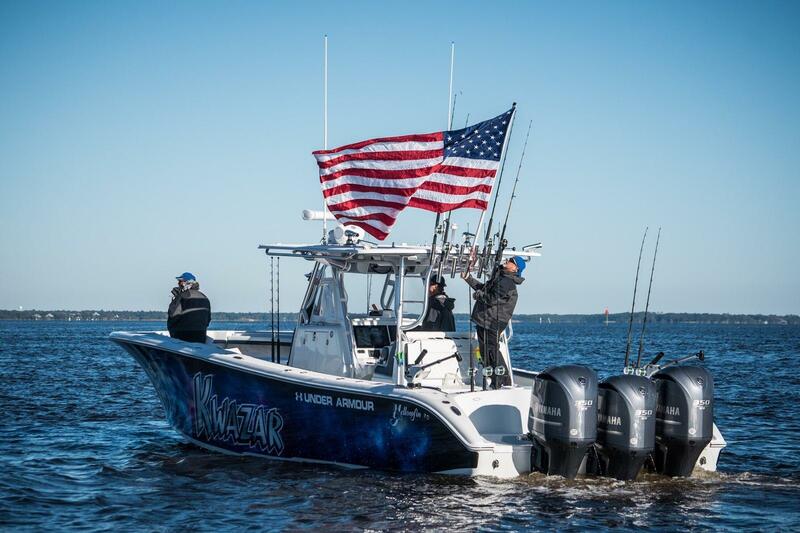 Team Liquid Fire, now fishing a Sea Vee 390Z, a much bigger and faster platform than their original 25 Contender, has even expanded beyond the boundaries of saltwater fishing. Their team’s boat was recently in freshwater in Lake Hartwell, a reservoir well into the upstate of South Carolina. Audrey worked out the logistics for Liquid Fire to be on hand at the Bassmaster Classic. They gave the VIP experience to the staff, dealers, and some contest winners to see the AFTCO pros at the event’s takeoff. All part of the Liquid Fire experience when they’re not burning up the road for the next king mackerel payday! It’s not that Audrey doesn’t enjoy being on the water herself, she just doesn’t generally get on board during the actual tournament. She has described herself as a bit of a “fair weather fisher,” but don’t let that fool you. Audrey is an integral part of the pre-tournament experience on the boat, and you can often find her on board with Crockett, both chasing bait and pre-fishing. She is quick to downplay her boat handling skills, but Mark made it clear that her talent level there is much higher than she makes it out to be! Team Liquid Fire has seen the peaks and valleys of major tournament king mackerel fishing. What’s more, they have seen it throughout the entire southeast, as their traveling schedule has definitely covered both the Atlantic and Gulf Coasts. With the planning and logistics required to pull off such a detailed scheduled, it’s clear that Audrey Henderson, the “Little General,” is as integral a part of Team Liquid Fire as there is. There is no doubt that her husband and sons are thankful for the time she spends making sure that things go without a hitch for the team. It won’t be long before grandchildren are taking to the water and joining the team, and they’ll certainly grow to appreciate what she does to fuel the competitive spirit of this top flight team! Who knows what 2018 holds for Liquid Fire, but with the planning advantage this team has through its management, they’ll certainly be looked at to defend their Kingfish Cup title! There is a movement afoot in the sport of king mackerel tournament fishing. A few seasons ago, some tournament directors started asking anglers what they wanted to see in the tournaments they fished and supported. Almost unequivocally, the response was “more cash.” A large segment of the king mackerel tournament crowd was not appreciating being rewarded with prizes other than cash, such as: boats smaller than the one they just won the tournament in, rebates on boats, vacations, or airfare, or other merchandise they had to pay taxes on and were almost always forced to sell at a loss. Is it surprising that the movement we are seeing is bringing forward more angler friendly events that pay out in cash only? If you give the fishermen what they want, most likely they will go fishing in these events. We’ve already waxed poetic about how this is provided in the Kingfish Cup, not only with the qualifiers, but with the championship as all. Bet more, and the payout is more. A simple concept, really. There is another way to get the same experience, however, in a completely different and equally exciting fishery. 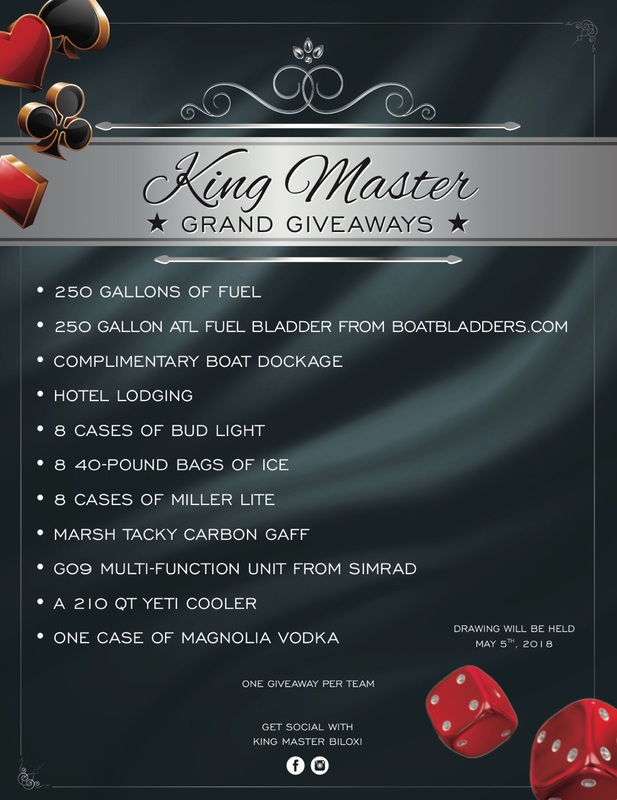 The resurrection of the Kingmaster in Biloxi, MS is another tournament (a standalone one, at that) that offers a massive payout, and rules that put the anglers first. In keeping with Gulf coast tradition, it should be a lot of fun on land as well! If you’re looking for a trip to the Gulf to supplement your fishing season in the Carolinas, this is the one. Take a few days at the end of May and beginning of June and try your luck. What’s more, the sponsors of this event are Yellowfin Yachts and Yamaha. Sound familiar yet? With a history of shooting photos for the Mississippi Gulf Coast Billfish Classic, Robbie Carter decided to bring back the deceased Kingmaster tournament, but run it more like the billfish event that was so successful. Boats check out on Thursday, May 30th from Point Cadet Marina in Biloxi, and they don’t have to be back until Saturday at 6 p.m. You can go anywhere you want and fish pretty much any way you want to. You’re welcome to make the run to Venice, Port Eads, or Grand Isle, and stay the night at one of the lodges if you are convinced that’s where the winning fish is coming from. You can fish at night, rather than stay in the lodge. Just catch the winners, keep them iced down on the boat, and be ready to weigh, back at Point Cadet Marina, on Saturday. If you need fuel, find a marina and grab the hose. There will be plenty of fanfare for the visiting teams as well. Robbie has gone as far as scheduling a parade prior to the blast-off. Of course, with his background in marine photography, you can expect the event and the participants to have their story well-chronicled. Folks, the money is there. With 100 entries, the tournament will pay $100,000 to first place. The calcutta format gives a lot of leeway for additional prizes as well. There are two additional levels each for cobia and wahoo, while king mackerel has three additional levels each for biggest king and aggregate total. What’s more, Robbie has instituted an early entry drawing for all boats registered by May 5. Without lifting a finger, teams will win from the following prizes: 250 gallons of fuel, a 250 gallon fuel bladder, free dockage for the tournament, 8 cases of Bud Light, 8 cases of Miller Lite, free lodging for the tournament, a Simrad 609 multifunction display unit, a Marsh Tacky gaff, a Yeti 210, or a case of Magnolia craft vodka! If there has ever been a reason to enter a tournament early, this is it! Based out of the Golden Nugget casino, the Kingmaster might be the perfect road trip for Kingfish Cup teams. It’s placement in the calendar puts it in a spot where it won’t interfere with your fishing season in the Carolinas, but will provide, at the very least, a good opportunity to get the team together with a realistic shot at some huge payouts. While there won’t be any Kingfish Cup points on the line, I don’t know many teams that would turn up their nose at the idea of a $100,000 or more payday! 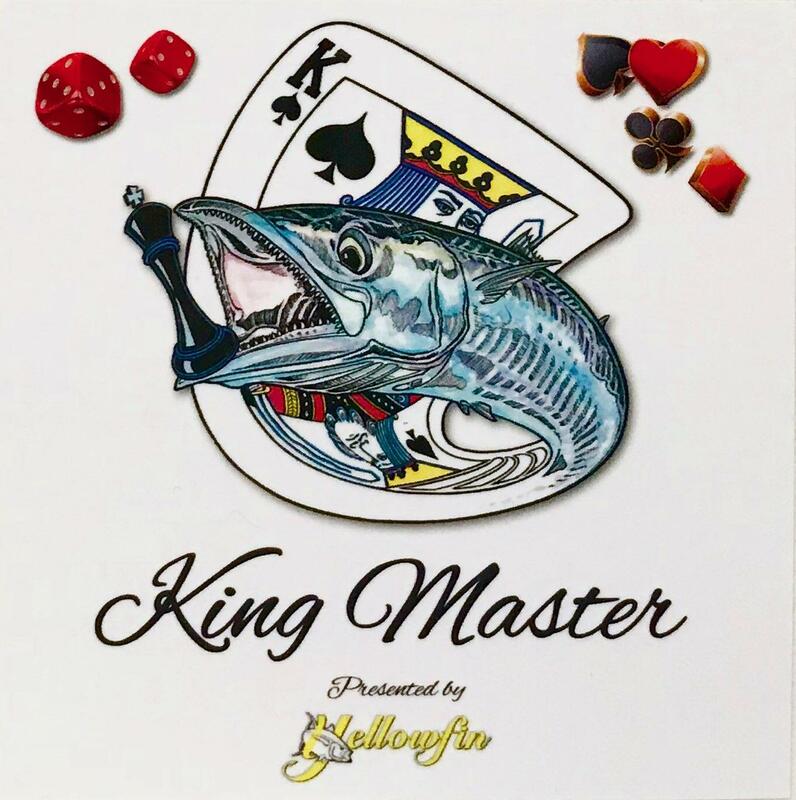 Find out more about Kingmaster at https://www.kingmasterbiloxi.com. There is plenty of time remaining to get signed up and eligible for prizes before the Gulf Coast fun and competition even starts!!! Fish the Far Out Shootout! The spring of each year is a buildup to fishing season, and it can be a real tease. The 2018 weather has been a roller coaster at best. The signs are there on some days that sustained better weather is right around the corner, and then, just like that, it seems to be winter again. Looking at the calendar, it’s still over two months until the official start of king mackerel tournament season with the Jolly Mon, but that doesn’t mean that there’s nothing to do in the meantime! With the center console boats and fishing background found in most of the field of the Kingfish Cup, there’s no reason that teams can’t take advantage of the spring and go further offshore to chase dolphin, wahoo, tuna, and even billfish! In the immediate Kingfish Cup region, the culmination of these trips is the area’s premier Gulf Stream tournament, the Far Out Shootout. This tournament will be hosted at the Ocean Isle Fishing Center from May 5-19, giving teams a large window to pick their weather window. For Benjy and Zack Faulkner, on Team Get Floored, the decision to fish the Far Out Shootout is hardly a decision at all! This is a part of their yearly fishing schedule, and they adjust work schedules accordingly. The team will be fishing a recently acquired 33’ Onslow Bay this year, and they feel that this is the perfect platform for both live bait king mackerel tournaments and offshore trolling with heavier tackle. As a tune up, they also have a trip to Oregon Inlet planned, which should serve the purpose of stocking the freezer with yellowfin and bigeye tuna, along with getting the team ready for competitive fishing on their new rig. Frollie Hughes, on the “Bay Pirate,” is a staple in king mackerel tournaments in the area, and this year, Bay Pirate has been added to the Kingfish Cup field as well. On a 34 Yellowfin with triple Yamaha power, this team can certainly fish the Gulf Stream comfortably, not to mention get there quickly. Offshore fishing is a good bit of what they do as well, and if they can get the weather they want, they’ll join the field at the Far Out Shootout. Frollie is a big fan of wahoo fishing in addition to king mackerel, and a big wahoo goes a long way in making up the winning aggregate in this event. Last year’s big wahoo in the event, a 37.95 pounder, was caught by Wayne Tew on “No Quarter,” yet another Kingfish Cup registered boat. For team “Bug N A Rug,” the Far Out Shootout represents a bit more of a run than it would for the two previous teams listed. Team Captain Stan Hollingsworth bases the team out of Wrightsville Beach, meaning that a trip to the weigh in is an hour plus at wide open throttle. Still, Stan says they’re not opposed to entering the competition, provided that the weather will mesh with everyone else’s schedule. If the team can fish it, then they’ll most likely do it! Kingfish Cup teams opting to add to their season early and chase different species, generally on different tackle seem to have some advantages over the rest of the field. While Wayne Tew’s big wahoo on No Quarter vaulted them into third overall for the tournament, the top two spots in the overall were taken by Kingfish Cup teams also. Lee Frick on the “Sea Bandit” took second overall with a 67.8 pound aggregate, with a blue marlin to boot. Ken Ritch was the overall winner with a 70.25 pound aggregate, and pocketed $8,200. Want bigger payouts? Get more boats into the field of this wide open tournament. With two weeks in which to choose your day and fish, you have plenty of options with your strategy. When you do decide to take off and go, just be sure to make it count! Visit https://www.oifc.com/tournaments#T1 for the full rundown on rules and the format for the 2018 Far Out Shootout. We’ll see you at the Ocean Isle Fishing Center docks in May! My name is Barrett McMullan. I am a king mackerel tournament fisherman that found his way into the most competitive redfish tournament series in the country; The One Man Elite Redfish Series. This is a story about my experience in the 2018 Elite Redfish Series Championship. In 2017, my third season of competitive redfish tournament fishing, I had established a 4th place ranking in the Eastern Division of the Elite Series and received an invite to the Championship event. This event took place as part of the Louisiana Crawfish festival March 23-25th, 2018. The Championship had a unique format whereby a winner would be determined by a match play framework. On Day one I was pitted against a formidable opponent, #7 ranked and very accomplished gulf angler. I had spent several days scouting the Delacroix area and had located what I believed to be several areas that were holding good fish. I had a historic day on the water on the first day of competition and weighed a personal best 40.92lbs with 5 slot redfish. That’s about equivalent to weighing a 55lb+ king mackerel in a southeastern, NC kingfish tournament. For day two, I was matched up against the #8 ranked angler who advanced by defeating the #3 ranked angler on day one. Coming off my day one performance whereby I had posted a weight more than 2lbs ahead of the field, I was feeling confident. Once I hit the water on the morning of day two that confidence began to dissipate. The water, which was already low, had dropped out even more and the wind shifted directions and increased to around 20knots. The fish I had been on at spot A, B and C had dispersed. By 11am I realized I was in trouble and went into scramble mode. The run and gun approach I transitioned to was intense, extraordinarily rough on my equipment and extremely stressful. With just a few hours to get 5 slot fish in the well I began to have minimal success. Rather than operating by normal protocol where a fish is caught, measured, weighed and marked for the well, I was short on time and moving at mock speed so I went to catching, measuring and straight to the well. I knew there wouldn’t be time for culling so the weighing and marking of fish was unnecessary. I kept focused on catching a full bag of 5 measurable fish and with no time to spare it was done. I had 5 fish in the well between 25.5” and 26.75” and considering the conditions and the curve ball I was thrown with my fish disappearing, I was appreciative and proud of my efforts to bring 5 to the scales. The Elite Series does a great job with their weigh-ins. The stage presence of the host is excellent and the time spent with co-anglers prior to weighing is tense and entertaining. Since the inception of the one man Elite Series tour the weigh site would include two separate above ground holding tanks. Once an angler advances thru the measuring station via the “bump man”, the angler moves his fish in a milk crate type box with holes and a lid into the first holding tank. This is where anglers tend to their fish keeping them upright and alive and wait for their turn to weigh their catch on the main stage. Once fish are weighed they are evacuated from the crates and deposited into the second holding tank where they rejuvenate before being released back into the open water. On this particular day there was only one holding tank for fish to be weighed and fish already weighed. As my opponent and I were talking the unthinkable happens. One of my very alive and very energetic fish exploded with movement kicking the top of my box open. With only one hand on the lid, which was closed up until this point the next move occurred in an unstoppable, surreal, slow motion sequence of events. One of my five fish jumped from my box and into the holding tank. Keep in mind there are other fish in the tank. Also keep in mind there are 12 eyes glued to the ruckus. As the fish rolled from the box he slowly swam directly across the tank. Angler 1 was the first to say, “there he is, I’m keeping my finger on him” as he pointed to the fish we had all seen exit my box. The fish came directly and deliberately across the tank to angler 2. Angler 2 reached down and had a hold of the fish. As he lifted from the water, the fish slipped out and slowly swam back across the tank. All the while angler 1 continues pointing and repeats, “I have him. That is the fish.” The fish swims a few feet away from me and into the waiting hands of angler 3. Angler 3 grasps the fish, lifts him from the water in plain sight of all anglers gathered around. As he is holding the fish he states, “That’s a six and a half pounder.” My box lid is open and angler 3 puts the fish back into my box. You would expect the reactions to be shock at what had just occurred. To the contrary, each and every angler laughed, shrugged, and stated something to the effect of, “wow, can’t believe that just happened." No further discussion of this event takes place and the weigh in continues. Approximately 10 minutes later, it is time for my match to weigh. My match opponent approaches the stage first feeling confident in his bag knowing what I had told him about my day. As he had predicted, his 5 fish weighed in at 34.48lbs. Next, I bring my fish to the stage. The host comments on the attempted fish escapee, laughs at the unusual event and proceeds to weigh my fish. To my surprise and my opponent’s, the host announces my 5 fish weight at 36.35lbs. I had done it! My first reaction was priceless. I was so surprised at my weight I believe I made the host nervous that his scales were off. My next move was to apologize to my opponent for underestimating my day. I confessed that I had not weighed a single fish during the day but knew they were all in the right length range between 25.5” and 26.75." I just never really computed in my head what I had. The host congratulates me on the win and welcomes me to the final day of competition and we talk about returning to the Crawfish Festival weigh in site for the second year in a row. As I exit the stage several co-anglers give me the thumbs up or high five as I take my place to watch the rest of the weigh in. It’s at this point that I approach my day’s opponent and congratulate him on his day and apologize again for unintentionally misleading him on my weight. His look back at me took me by ultimate surprise as I could tell he was in anguish. At first I thought he was really upset about my sandbagging. Then he told me, politely, in more or less words, that he was questioning whether the fish that had escaped my box temporarily was the fish that was put back in. I took about 3 steps back and didn’t know whether to swing, argue, or walk away. I briefly started to explain that it was the right fish. We were all there and saw the same fish get put back in my box. I could tell this wasn’t going anywhere. I felt very comfortable with my position as there had not been any indication of a problem until this very moment. I told him I didn’t want any controversy and wanted to do this the right way so I suggested we talk privately with the host. He agreed. My opponent and I pulled the host off to the side and I explained the exact sequence of events that surrounded my fish escaping my box and being put back in. I then followed that up with stating that I acknowledge my opponent is upset and while I think we all know the correct fish were weighed I didn’t want to be part of any controversy. This championship event was only paying first place. The final day would be a battle of the top 6 anglers for one prize. For this reason and the fact that I wanted to make him feel comfortable with the result of the day, I suggested to the host that my opponent be allowed to compete as well on day 3 making it 7 competitors rather than 6. He appreciated the comment and agreed in principal. In effort to get full information the host called two of the anglers over to the conversation that had been involved in the recapture of my fish. He asked them both if they were confident the correct fish was put back in my box. The answers were to the effect of, “yes, we are fairly certain the right fish went back in the box”. The host then questions if “fairly” certain means “certain”. They now began to waffle as they recognized their testimony was going to have significant impact on who would be advancing. Their answer turned from “fairly sure” to “pretty sure” to “well it’s possible it wasn’t”. I was in disbelief at what was happening. The next question from the host to the two anglers was, “considering we are only fishing for one place tomorrow and considering this unfortunate situation, would you be ok if both anglers from this match advanced to day three rather than one. The answer given from one from angler and then echoed by the other was, “No. We worked too hard to get here. Adding another angler that we have to beat on day 3 wouldn’t be fair.” They were dismissed from the conversation. The host called over the co tournament director and then briefly conversed privately. Clearly the tide had swung against me. The host was in a terrible position. He had three options. One, he could side with me based on the fact the weigh in had already occurred, there were no objections prior to weighing the fish and there were eye witnesses supporting my claim. Two, he could side with my opponent that I lost control of my fish and there was no guarantee the fish I weighed were the fish I caught. Or three, he could elect to allow us both to advance considering the tours responsibility for utilizing only one release tank on this day and risk antagonizing the other competitors fishing day three. Citing he could only rule on 100% certainties the host made the call to disallow my weight for the day and put my opponent through thereby sending me home. As this is happening I’m saying to myself, “Think. I know there is a way I can present this to make it end the way it is supposed to." It’s one of those situations where you know when all the dust has settled you’ll kick yourself for not doing this or not saying that. The truth of the matter is my emotions were running so high by this point to try and convey a clear and calculated thought simply wasn’t possible. My last request to the host before departing was that he asks the remaining competitors again if they believe a 7th angler should advance based on the extenuating circumstances. I never heard whether this was done or not and what the result of the question was if it was asked. Opinions will vary on where blame lies in this situation or what “should’ve” been done. After struggling thru the ranks for the past 3 years in a sport I knew nothing about in places I never knew existed this was my first chance to rise to the top of the mountain, and then, gut punch. Capt. Brant summed it up just about right, “you’re going to be the smartest S.O.B. around with all the hard lessons you learn."